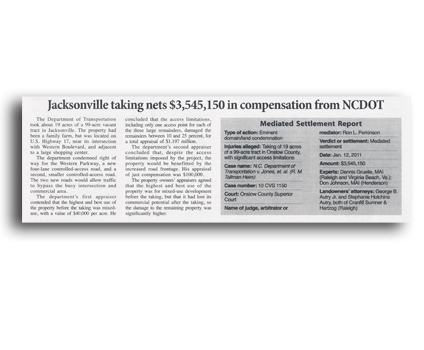 The Department of Transportation took about 19 acres of a 99-acre vacant tract in Jacksonville. The property had been a family farm, but was located on U.S. Highway 17, near its intersection with Western Boulevard, and adjacent to a large shopping center. The department condemned right of way for the Western Parkway, a new four-lane controlled-access road, and a second, smaller controlled-access road. The two new roads would allow traffic to bypass the busy intersection and commercial area. The department’s first appraiser contended that the highest and best use of the property before the taking was mixed-use, with a value of $40,000 per acre. He concluded that the access limitations, including only one access point for each of the three large remainders, damaged the remainders between 10 and 25 percent, for a total appraisal of $1.197 million. The department’s second appraiser concluded that, despite the access limitations imposed by the project, the property would be benefitted by the increased road frontage. His appraisal of just compensation was 100,000. The property owners’ appraisers agreed that the highest and best use of the property was for mixed-use development before the taking, but that it had lost its commercial potential after the taking, so the damage to the remaining property was significantly higher.